T.38 Fax Image Decoding allows an application to obtain a facsimile image from a previously recorded file and real-time sniffer T.38 Fax over IP data streams. 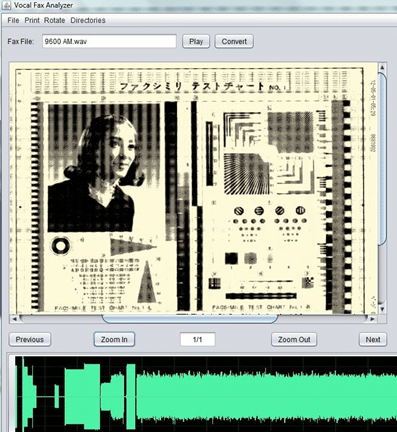 The software library supports fax image extraction and decoding for both high speed (V.34) and low speed (V.17 and below) fax transmissions over T.38. When paired with VOCAL’s Facsimile Lawful Interception library, this combination of fax demodulation and decoding software provides developers a foundation for a range of lawful intercept (LI) possibilities with facsimile monitoring, interception, frame capture and recording. VOCAL has substantial experience with FoIP lawful intercept and recording technologies and can advise developers in the proper configuration of your recording system. For important recordings with incomplete or damaged capture files, manual intervention may be able to recover some or all of the relevant data. Contact us for a demo. VOCAL’s T.38 fax decoding software is optimized for DSPs and conventional processors from TI, ADI, ARM, AMD, Intel and other leading vendors. Custom designs are also available. Our extensive experience with fax design, implementation and configuration will help you select the right solution for your T.38 fax decoding application. VOCAL’s optimized software is available for the following platforms. Please contact us for specific T.38 fax decoding supported platforms.